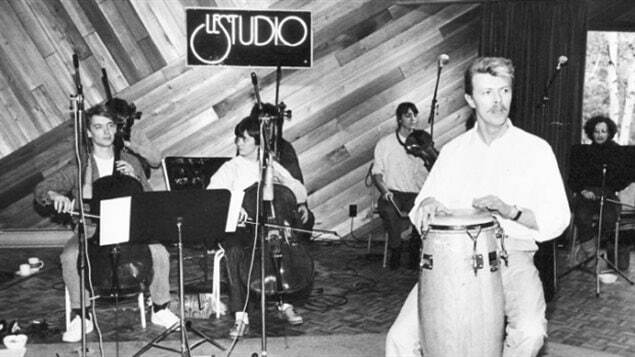 David Bowie recording his album 1984 album 'Tonight' at Le Studio. Le Studio, in Morin Heights, Quebec, just north of Montreal, was the setting for some of the great albums of the 1970’s and 1980’s but it has been silent and neglected for years. Now for sale, a piece of Canadian history, and musical history may soon be demolished. It all began with the sound recording genius of Andre Perry. In 1969 he was thrust into the spotlight as a result of recording John Lennon and Yoko Ono‘s ‘Give Peace a Chance’ song, during the ‘bed-in’ at the Queen Elizabeth Hotel in Montreal. John Lennon was so grateful for the brilliant work, he put Perry’s name and address on the label of the record. 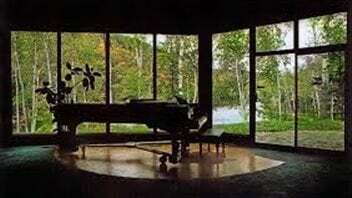 By 1974 Perry and his wife, Yael Brandeis, opened the studio in the Laurentian forest by a lake. This oasis brought musicians to retreat and record on the state of the art technology at the time. Some of the great albums of the past came out of this studio. The Police recorded ‘Ghost in the Machine’ there as well ‘Synchronicity’, including the single,’Everything She Does is Magic’. The Bee Gee’s did two albums including Saturday Night Fever in Morin Heights. Keith Richards did his solo project, Talk is Cheap. Bryan Adams did Cuts Like a Knife and David Bowie recorded ‘Tonight’, to name just a few. André Perry sold the place to the Spectra Group, the people behind the Montreal Jazz Festival. Then it was sold to a numbered company, but the building was not maintained, and with a sagging roof and water pooling inside, it’s a dangerous place for the pilgrims and fans who come to see where their heroes recorded. I see there is a GOFUNDME page setup with various people that have donated to the cause. Have you tried to contact the artists that had recorded there and possibly tried to gain their support? Good luck and hope you obtain your goal. Isn’t there a person who could set up a fund or a grant or something? This is part of Canadian and ameircan history. I know there are plenty of people who would be in awe to visit this place. There’s got to be something!!!! Wouldn’t some of the music industry’s stars contribute to a peice of history. This is so sad. The music that this place gave us is irreplaceable lets Give back what it gave us…it life it’s .music. We need its history lessons….somebody please don’t let it just die. Who do I contact about buying it. I would like to restore it.